Just because your child wants to channel the regal bravado of a knight in shining armor for an upcoming Halloween party or school play doesn't mean you have to break the bank. Instead of paying for a store-bought, run-of-the-mill costume, create your own knight costume using simple, inexpensive household items. The main ingredient for this project is duct tape, a highly versatile and easily accessible adhesive that will save you time and money. Liven up the costume with colorful custom decorations, an opportunity that an impersonal pre-manufactured costume wouldn't afford you. Make the breastplate by covering a paper grocery bag with strips of duct tape. Continue this process until the outside of the bag is completely covered. Use a pair of scissors to cut a slit down the duct-taped grocery bag's printed side, and cut a 7-inch neck hole in the bottom of the bag. Measure about 1 inch from the bottom of the bag and cut a 4 1/2-inch hole on either side for the arm holes. Cut a 20 x 15-inch diamond-shaped piece of cardboard; this will be the base of the shield. Cover this piece with strips of duct tape. Cut out a 5 x 2-inch rectangular cardboard strip and cover it with duct tape. Bend the piece an inch at either end, and then use craft glue or hot glue to attach it to the back of the shield as a handle. Cut a piece of cardboard in the shape of a "T"; make the long end pointy as this will be your child's pretend sword. Cover the piece of cardboard with duct tape. Use your scissors to slice off the top end of a clean, dry plastic gallon jug to begin creating the knight's helmet. Cut along the indented portion of the jug, removing the handle section entirely; this will create the opening for your child's face. Cover the jug with duct tape. 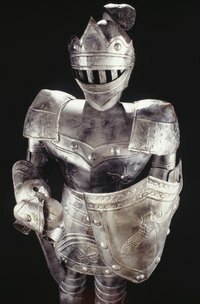 Place your child in a gray sweatshirt and sweatpants, and then put on the breastplate and helmet portions of the costume. Have your child hold the sword and shield. Get the look of chain mail with a long-sleeve gray thermal shirt and thermal leggings underneath the knight's armor; these items can be used in place of the sweatpants and sweatshirt. Add embellishments like crests using poster paint or other colors of duct tape.